Money Station blends hands-on activities, worksheets and standards-based skill sets to form a comprehensive money program. Includes a spiral-bound 126 pg. 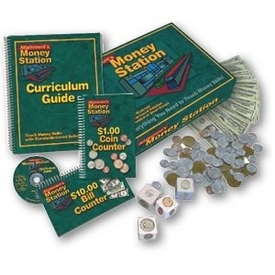 Curriculum Guide, booklets for coin and bill counting, realistic imitation money and two durable Coin Cubes, used in adding and equivalency activities. The Curriculum Guide has eight sequenced skill sets with objectives, assessment sheets and worksheets with realistic illustrations, appropriate for all grades. The $1.00 Coin Counter pictures actual size coins, ideal for match-to-sample activities. The $10.00 Bill Counter begins at a dollar, with each page increasing twenty-five cents in value. Both show change back examples. Includes a Win/Mac CD with PDF to print out worksheets and assessment forms.